Many of you know Paul Akers of Fastcap. He’s a very passionate lean practitioner, and Gemba Academy has several videos where we talk to him and tour his company. Almost two years ago I was talking to him and he told me how he, in his 50s, was finally getting into great physical shape. He had lost fifty pounds by focusing on diet and exercise and creating accountability by telling his story on social media. Last year he published Lean Health, which goes into more detail why he made this change and how he leveraged several lean principles to help with it. We’re almost the same age, and his story really resonated with me. After talking with him I went home and made my first green super smoothie and committed to the journey. A year later I had lost over 30 pounds and continue to be in the best shape I’ve been in since I was on the swim team in high school many decades ago. I’ve run a full marathon and do crossfit (actually, “surf fit“) pretty much every day. Ron at Gemba Academy has achieved similar results, and we’ve created a wellness program at the company that encourages and rewards healthy behaviors and choices. 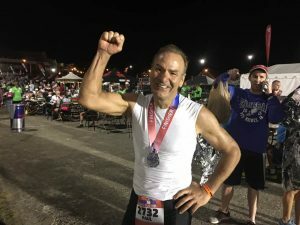 Paul continued his journey by adding other training components, and last month he completed the Lake Placid Ironman. Think about it: a couple years ago he was an overweight executive. This year he swam two miles, biked 112 miles, and ran 26.2 miles – on the same day. And I thought running 26.2 miles was an achievement. He even beat my marathon time… after swimming two miles and biking over 100 miles! Paul doesn’t just talk about lean and health, he does it. He walks, and swims and bikes and runs, the talk. As our two video series on Fastcap show, his company does a remarkable job with leveraging the power of small, daily improvements. Even their bathroom is kept clean thanks to kanban and 5S. Many people talk about lean or how to lose weight and get into shape, but far fewer actually do it, every day. As leaders we need to practice what we preach. This will mean accepting and owning failure, but then learning from it. I know we often struggle with this at Gemba Academy, but we learn, and we’re better for it. One reason we’re different is because we’re practitioners who learned how to make great videos, so we’ve been in the shoes of our customers with the difficulty of of the continuous improvement journey. I also struggle daily to stick to my plan, to keep my desk organized, and to stay in shape. Once you experience the rewards it becomes easier, but the struggle remains in some form and requires ongoing reflection and recommitment. Thanks, Paul, for the motivation – in lean and in health.